Bequia is a beautiful, diverse little island, consisting of no more than seven square miles lying nine miles south of St Vincent, north of Mustique. It the northernmost and largest of the Grenadines, a string of islands that stretch for approximately 60 miles between the islands of St Vincent and Grenada in the Caribbean. Bequia is too small for big industry, yet large enough to offer the basic needs. The size of the island has also determined the character of its inhabitants. Since they must acquire commodities from abroad, Bequians have had to look to the sea for their living, working as merchant seamen on freighters, as captains and crews on cargo ships, on yachts and cruise ships, and as fishermen and lobster divers. The first settlers of Bequia were the Arawaks, and later the warlike Caribs1. 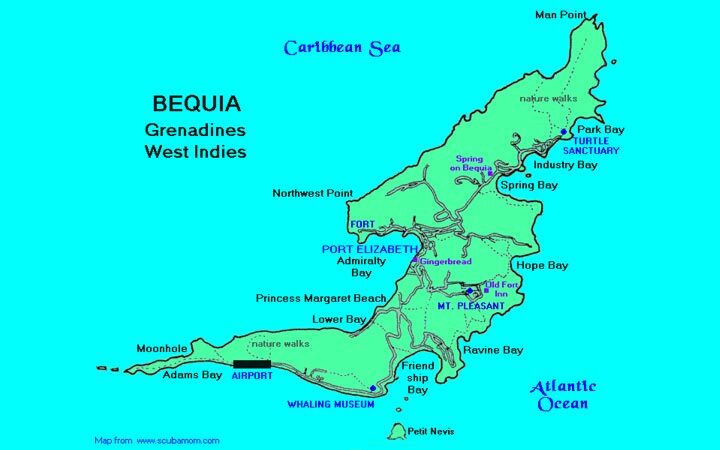 In 1664, France laid claim to Bequia, but did not establish a permanent settlement there. In 1675, the slave ship Palmyra sank off the Bequia coast. The Africans who managed to swim ashore eventually mixed with the native Caribs to form the 'Black Caribs'. The fighting ability of the Caribs kept Europeans out of St Vincent and the Grenadines, even while they were taking over the rest of the Caribbean. 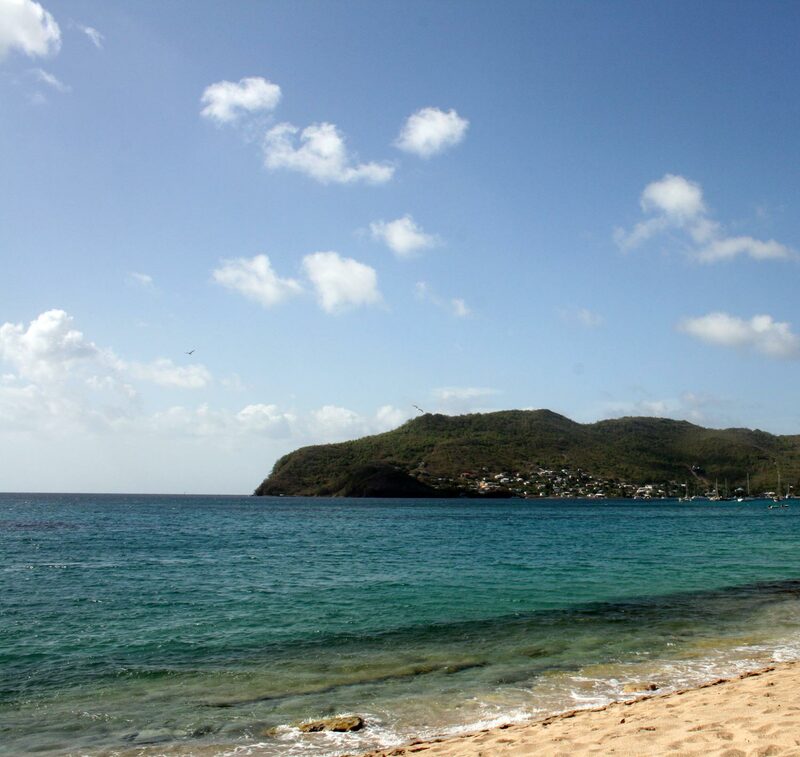 Between 1719 and 1763, French settlers set up lime, indigo and sugar factories in Bequia. By a treaty between the French and English in 1763, St Vincent and the Grenadines was designated British. The island, now mainly in British hands, began to cultivate cotton and then sugar, and they began to import slaves from Africa to help in the enterprise. In 1834, the slaves were emancipated, and this caused a decline in the planter economy. Since the Bequians had always depended on the sea for much of their food, and for all their communication with the outside world, there was a surge in whaling, fishing, and trading throughout the islands. Boat building became a large part of the Bequia trade. From the 1840s until very recently almost all the regional trade in the Eastern Caribbean was carried on boats built either in Carriacou or Bequia. In 1979, the State of St Vincent and the Grenadines achieved independence within the British Commonwealth. Bequians now look for their livelihood to lobster diving, fishing and tourism. William Thomas Wallace Jr came from Scotland, and he introduced whaling to Bequia. Having worked on one of the New England whaling ships that came to the Caribbean chasing the humpback whale, Bill Wallace started his own shore whale fishery in the mid 1870s out of Friendship Bay. The Ollivierres from France followed suit in 1876 with a fishery at Petit Nevis (a small off-shore island just south of Bequia). Whale meat was a staple food for the population in those days. Today only one small whale fishery exists. A crew of six sails out on a 26-foot traditional double-ended whale boat. The design is based on that of the small boats carried aboard the large whaling ships that sailed the Caribbean before the 20th Century. There is great excitement on the rare occasion when a whale is caught. Groups gather on the hills to follow the hunt. The butchering is done on Petit Nevis with a constant stream of small boats carrying loads of people to watch and celebrate.